CORRECTION: The General Election date is November 6th, 2012. The deadline for voter registration for the General Election is October 9, 2012, one week from today. Advanced voting in person starts October 15, 2012. And while we’re at it, be skeptical of anything you read on the internet. 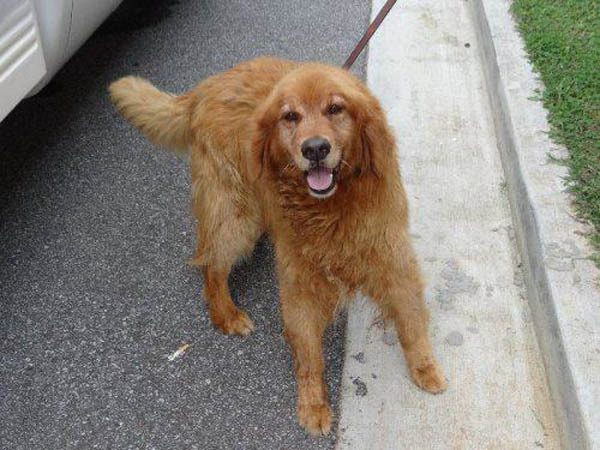 27847 might be a senior, and she’s definitely at least part Golden Retriever. She is available for adoption from the Gwinnett County Animal Shelter beginning Friday. 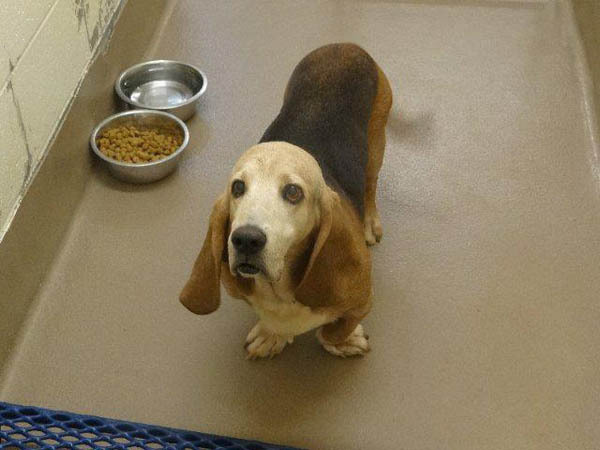 If this Senior Basset Hound is adopted, he’ll almost certainly be named “Flash.” The senior male will be available for adoption from the Gwinnett County Animal Shelter beginning on Thursday. Bibb County Animal Shelter’s new director started work this week. Tenon was introduced as the new director of Bibb County’s Animal Welfare Department at a Monday morning meet-and-greet at the county courthouse. The Hawkinsville native, who turns 49 Tuesday, takes over the reins of the animal shelter after a sometimes stormy search for a new director. “All I want is someone to come and adopt and give these animals a forever home,” she said. “I encourage the public to give her some time,” Davis said. That committee also is looking for a site for a new shelter, which animal advocates say is long overdue. The county commission has allocated $3 million in sales tax funds for the new building. “The old one needs to be bulldozed down,” said Linda Smyth, a board member for Central Georgia CARES, an animal advocacy group. The old shelter is near the county landfill and is “roach- and rodent-infested,” which is not good for the health of the animals there. 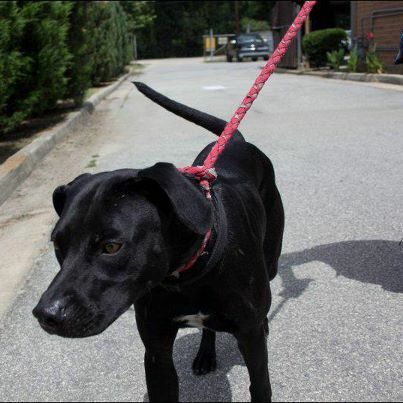 This good-looking black lab is one of the dogs in the Macon Animal Shelter that Ms. Tenon hopes to re-home. State Rep. Bill Hembree holds a significant lead among likely voters in the November 6th Special Republican Primary Election for Senate District 30, with 45% of likely voters saying they will vote for Hembree. We released the poll yesterday via the website. On election day, General Election voters who live in the 30th Senate District will either ask for or be offered a ballot for the Special Republican Primary Election, which is technically distinct from the General Election. Hembree will face independent James Camp, who previously ran for office as a Libertarian in a January 8th Special Election. National Public Radio is covering the dispute over whether national polls on the Presidential election are skewed to favor President Obama. For those of you who are obsessed interested in polling, I’ve written up my thoughts on weighting and how it can introduce bias in polls. Even if you don’t read it, hit that link for a cogent analysis by Stephen Colbert. A group of people from other states rode a bus to Georgia to pressure Governor Deal to ignore other people from out-of-state and put Georgia first. Who knew Occupiers could drive? The PAC known as Patriot Majority USA has started a national bus tour to bring awareness to what they call the Koch Brothers’ ‘Greed Agenda. They rolled through Georgia today, stopping at the state capitol to deliver a message to the governor. Here’s how I measure whether Deal has put Georgia families first: jobs. And Gov. Deal has delivered. Gov. Nathan Deal announced [yesterday] that jobs and investment generated by the Global Commerce division of the Georgia Department of Economic Development jumped by almost a third during the state’s most recent fiscal year. The department reported that the 403 company expansions or locations with which it assisted created 28,776 jobs, an increase of 29 percent from last fiscal year, and $5.97 billion in investment, a 32 percent increase. These statistics reflect a trend of continued growth since the state’s 2009 fiscal year. The 403 projects worked on by GDEcD’s Global Commerce Division during fiscal year 2012, which ended June 30, 2012, also represented an 11 percent increase from the previous year. Of those projects, 36 percent were new locations, highlighted by companies such as Baxter, Caterpillar and Bed, Bath & Beyond. These three projects alone created 4,100 jobs. The remaining 64 percent were expansions by existing Georgia companies. The largest of these expansions were by Kia Motors Manufacturing Georgia (1,000 jobs) and Home Depot (700 jobs). Republican Congressmen Phil Gingrey and Tom Graves, and Georgia Speaker David Ralston, State Rep. Katie Dempsey, and State Senator-Elect Chuck Hufstetler attended a Rome fundraiser for Eddie Lumsden, who is running for State House of Representatives against Democratic incumbent Barbara Massey Reece. Lumsden served in the Georgia State Partrol and on the Floyd County Commission. Deputies who stopped Bibb County Superior Court Judge Howard Simms when he was driving and found he had a blood alcohol content of .083, over the legal limit, did not follow department guidelines by failing to require further sobriety tests and showed “poor judgment” in following the judge home after releasing him. 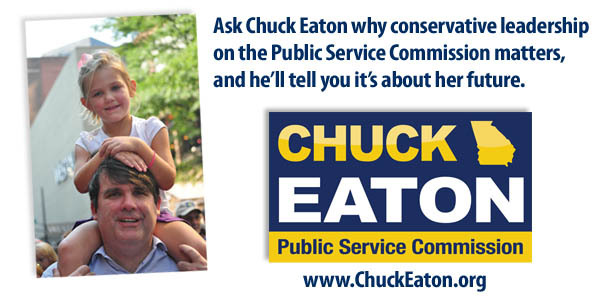 [Incumbent Democrat] Stoner also was a backer of the TSPLOST— which made the eight-year veteran of the Senate a rarity among the Cobb legislative delegation. 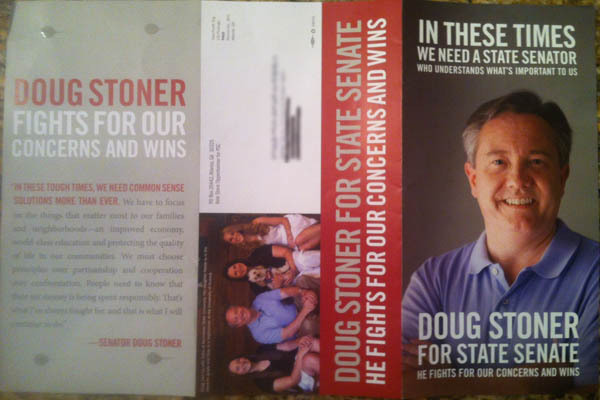 Stoner is locked in a heated re-election campaign against Republican Hunter Hill of Smyrna, who did not take a position on the TSPLOST. Hill told Around Town on Monday that some of the seven were surprised to see their names on the letter. “Some of the people in the left column were not aware of the letter and told me they were very disappointed that their name was used,” he said, but added he had not talked to the entire list. “I do not think this letter is going to call into question my credentials as a Republican nor the support that I’m expecting it will get from Republicans,” added Hill. Some of those names also appeared on direct mail that landed in the mailbox of one of the most-consistent Republican Primary voters I know. 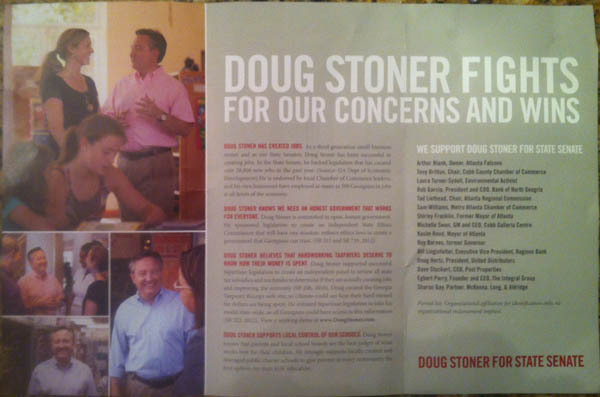 It appears that Stoner’s direct mail firm misspelled the name of Tad Leithead, one of the alleged Republicans for Stoner. Leithead is Chairman of the Cumberland Community Improvement District, which announced that it will spend $30 million to attract $150 million in state and federal funds for transportation improvements in the CID. Leithead said the two CIDs are the largest economic engines in Cobb County. They are also the only two districts in the county this year that saw an increase in property tax assessments. Leithead said he expects his CID will tackle the Windy Hill Road interchange at I-75 with the anticipated $150 million it intends to bring in over the next seven years in a proposal that would add the capacity for more traffic while at the same time improving the safety of the exit ramps. The chairman said it was unlikely the Cumberland CID would be contributing a significant amount to the proposed $1.1 billion KSU-Midtown bus program recommended by the county’s alternatives analysis study. “We’ll continue to monitor it and support it and remain in favor of it, but I don’t see us becoming big-time investors in the project because our dollars just wouldn’t go that far with a project of that magnitude,” Leithead said. Georgia Democrats are threatening to sue to remove State Rep. Rick Crawford from the ballot after he said that he’ll switch to the GOP if re-elected. The Democrats say Crawford should be disqualified because he’s declared himself as Republican and hence is no longer the party’s candidate. At a press conference Monday, party Chairman Mike Berlon says Georgia law prevents Democrats from replacing a candidate at this point if he or she withdraws. University of Georgia political science professor Charles Bullock says the move is unusual. 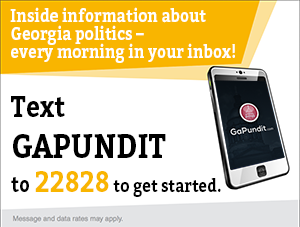 Other Georgia politicians have switched parties but typically after an election, not before. He also says Crawford’s decision is puzzling. Quote of the Day goes to Democratic Party of Georgia Chair Mike Berlon, via 11Alive. Yesterday, we released a poll of HD 16 that shows Republican Trey Kelley with a solid lead over Crawford. Pro-tip: Attorney General Sam Olens has a good sense of humor, but as the state’s top law enforcement officer, if you’re holding a charity roast of him, tread lightly, just in case. Hundreds of people turned out to watch Olens take barbs from Cherokee County State Court Judge Alan Jordan; Cobb County Commission Chairman Tim Lee; Cobb Chamber of Commerce President and CEO David Connell; and John Wallace, Cherokee Republican Party precinct manager. Connell used a photo slide show during his roast of Olens that showed the attorney general on the campaign trail and with his family, whom Connell said he consulted while preparing for the event. “They all said the same thing: ‘Sam is not funny,’” Connell said. Gary could face up to 10 years in prison and a $250,000 fine. The City of Sugar Hill is considering whether to join other Gwinnett cities in levying an excise tax on energy used in manufacturing, following the repeal of the state tax. Apparently these cities don’t want manufacturing jobs. Lowndes County’s SPLOST is up for renewal in the General Election on November 6th. If it passes, proceeds will be split with the cities in Lowndes. The seventh cycle of the Special Purpose Local Option Sales Tax, on the ballot Nov. 6, will bring in at least $150 million during a six-year period to fund the new auditorium and library and other municipal projects if the referendum is approved by voters. Problems in the City of Savannah Purchasing Department are more serious than originally thought. Original reports from more than a month ago didn’t go into detail about the ramifications of the hundreds of bills that the city hadn’t paid for goods and services and how citizens might be affected if these lapses continued. Upon closer inspection, they were serious. As this newspaper’s City Hall reporter, Lesley Conn, outlined on Sunday, these problems potentially threatened the city’s water supply and the public safety of citizens and police officers who protect them. That’s not a bureaucratic headache limited to government paper-pushers. It’s a potential nightmare that could affect everyone. No wonder why Mayor Edna Jackson and a majority on City Council asked City Manager Rochelle Small-Toney to resign last week. Her credibility is gone. The situation inside the Purchasing Department, which had been turned on its head, apparently at the city manager’s direction, was bad enough. But the more that’s uncovered, the worse it seems to get. • Concern from the head of the city’s water department. He was worried the city wouldn’t be able to acquire the chemicals it needed to make the water safe because its vendor would put it on credit hold. • A worried email from the officer who supervised the metro police department’s armory. He was concerned about an order for 590 new Glock handguns for police officers, submitted months earlier. He was giving it “emergency” status. The problems within the Purchasing Department were among the reasons the mayor and council reprimanded Ms. Small-Toney on Aug. 31. They asked for immediate improvement on her part within the next 90 days. Instead, things appeared to be deteriorating. So they asked her to resign by this Thursday’s City Council meeting, or be fired — a perfectly fair, reasonable and necessary option. The bacon shortage shouldn’t us affect much more than a slight increase in price, but I’m not taking any chances — I’ve stocked up with Benton’s Bacon from Madisonville, Tennessee, the finest I’ve ever tasted. Good luck fitting into your parachute pants from 1984 as you prepare to relive the past at Saturday’s concert featuring Pat Benatar, Journey and Loverboy at Aaron’s Amphitheatre at Lakewood.